At last, the end has come for the long international legal dispute over the name of the country that lies north of Greece and south of Serbia. It is now the Republic of North Macedonia and Greece has dropped objections to it joining international organisations like the EU and NATO. The country has been known to itself, and to most of the rest of the world, as Macedonia since its independence from Yugoslavia in 1991. However, Greece has objected to this name on the grounds that “Macedonia” implies a claim to the northern Greek region that shares the name, and appropriates an aspect of Greece’s culture and history. As a result, it has been recognised at the United Nations as ‘the former Yugoslav Republic of Macedonia’ (FYROM) since independence in 1991. We wrote about the long historical background to the dispute here. The current governments of Greece and Macedonia have both made solving the dispute a priority and reached a compromise, known as the Prespa agreement, on 12 June 2018. 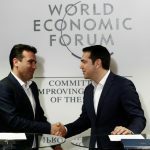 Under this agreement the country becomes the Republic of North Macedonia and renounces any idea of a claim to leadership over Macedonians in other countries, while Greece acknowledges the separate nationhood of North Macedonia. We wrote about the agreement here. Both governments faced opposition from nationalist politicians at home. The agreement went to a referendum in Macedonia in September and although the vast majority of those who voted supported it, there was a boycott and the turnout fell below what it needed to be for the result to be constitutionally valid. Undaunted, the Macedonian Prime Minister Zoran Zaev used an alternative route to get approval for the agreement and on 11 January 2019 it achieved the necessary two-thirds majority in parliament. There have also been bumps on the road in Greece. 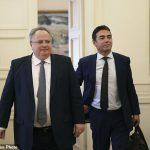 Prime Minister Alexis Tsipras leads a left wing party, Syriza, but he was in coalition with a smaller nationalist party that walked out of the government over the Macedonia agreement. Despite this, the government survived a confidence vote on 16 January and intends to implement the agreement. Nationalist Greeks demonstrated in Athens on 20 January but the numbers fell short of what its organisers expected. The Greek parliament ratified the agreement on 25 January with a vote of 153 in favour, 146 against. The economic and strategic benefits of closer association with the EU and NATO, and eventual membership, are attractive to the North Macedonian government. Zaev and his colleagues see them as a route to greater security and prosperity for what is now a poor and strategically vulnerable country. It is not the only country in the region in which there is a divide between politicians who see their future with Europe and those closer to Russia; the same tensions exist in Belarus and Moldova. For Greece, the rewards are much smaller, but still real. Greece has often been seen as a problem country within the EU because of its financial crisis but solving the Macedonia problem has brought respect for Tsipras and Greece in other European capitals for having done something constructive. 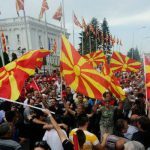 Fruitless Years Rowing Over Macedonia – but an end in sight? Nice comment on an obscure topic. I love how you manage to cover somewhat unfashionable areas of world affairs!